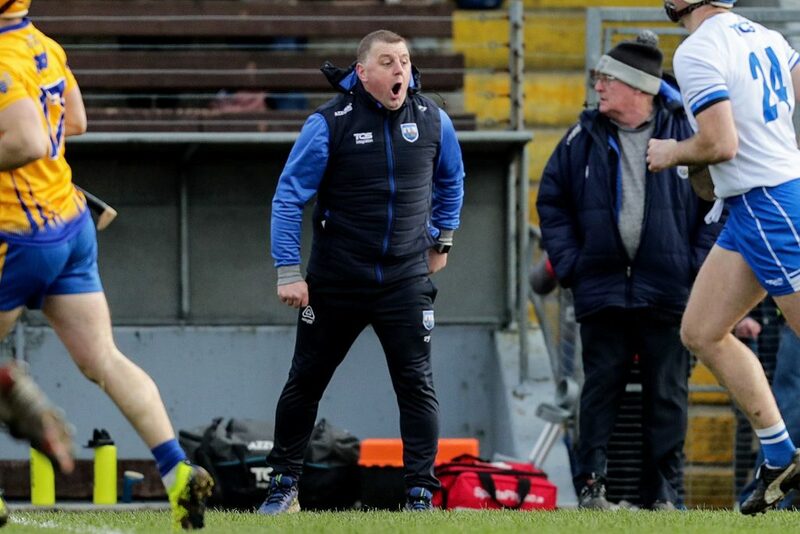 Waterford manager Paraic Fanning getting his point across during Saturday’s NHL win over Clare in Walsh Park. Photo: INPHO/Laszlo Geczo. After facile wins over Offaly, Laois and Carlow, Waterford are now getting to mix it with the top teams and they’re liking it. A lot. Galway last week, Clare this week and next weekend it will be Galway again, this time with the prize of a league final appearance up for grabs. A 14 point win over Clare might have made a few more people sit up and take notice at what’s going on in Waterford hurling circles but Paraic Fanning and his troops certainly won’t be getting carried away. Much was made about this game being a dress rehearsal for their Munster SHC meeting at the same venue in two months time but Paraic wasn’t making much of that in his post match thoughts to the press. Next weekend it’ll be Galway for the second time in three weeks, this time in a league semi-final. After putting up big scores in nearly every game this year, people are saying that this Waterford team are playing with great expression but Paraic is slow enough to buy into the hype. “I’m not sure. There’s a lot of talk about the way we’re playing but essentially we’re making good decisions and working hard to do that. If the good decisions we make turn into good scores then we’re happy with that. We’ve only tweaked a couple of things so I think there’s too much emphasis on systems but at the end of the day the lads made plenty of good decisions today and we ended up putting a big score on the board. We only had three wides today. Some days that happens. I’ve been on the receiving end of that too when you play against a team that everything they hit goes over and today nearly everything we hit went over and you take that when it comes your way. “I think similar to last week against Galway, the foundation for the win was laid in the first-half. We managed to do a lot of good stuff against the breeze and get up the field and keep the scoreboard ticking over. I think some teams when they play against the breeze they can become too defensive and then you can find yourself chasing too much so I was quietly pleased with where we were at half-time as we knew that it was going to be a difficult breeze to play against. “I’m thrilled with all the lads today. The big plus for us is that they’re a great bunch of lads and they work very well as a unit. Look we’re doing the best we can and whether we’ll get a big result out of it in the end I don’t know but all that we can do is to keep pushing the boundaries and see where that takes us. On the injury-front, the outlook is definitely getting a bit brighter with every passing week. While the forwards have been garnering most of the praise, Paraic is very happy with the way the backs have been playing of late. “We’ve had three tough games in a row now and while we weren’t over happy with ourselves in the Dublin game we took a lot of out of that game and we’ve done well in the last two games against Galway and Clare and we’ll hope to build on that,” said the Déise boss.